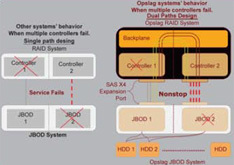 D1-QJ6 6G SAS-SAS system is specially designed for high availability applications. The D1-QJ6 is well equipped with fully redundant components for all major functions, including redundant JBOD controllers, power supplies, fan modules, and SAS JBOD expansion ports. Being hot pluggable, all of them provide nonstop services. Distinct from others, D1-QJ6 is able to upgarde firmware without system down time. And in case of multiple hardware failures as shown below,Opslag’s design of dual paths between Opslag RAID systems and JBOD systems will still provide services; while other vendors will not be able to provide any service. All D1-QJ6 systems are equipped with Opslag’s default green features for power saving. In most cases, the hard drives consume most power. With the autodisk spin down feature and proper configuration, the power consumption ofhard drives can be reduced to a minimum, and users will not even notice this feature. D1-QJ6 monitors the environment temperature for cooling mechanism and the fan modules respond accordingly. The power supply modules are all 80 PLUS power efficient for better power converting rate. In virtue of the reduction of hard drive power consumption, the advanced cooling mechanism, and the energy-efficient power supplies, the unnecessary power cost is decreased greatly.